Maybe you’re not looking to make the commitment to full time farm work just yet. Our workshare program may be perfect for you! 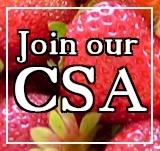 Workshares have the opportunity to be a member of Jubilee’s CSA by working 4 hours a week for the duration of the CSA Session. These folks are an invaluable asset to the farm, we have many people who have been coming out to do a workshare for 8+ years. We have two kinds of Workshares: a Harvest Share and a Market Share. We hope many of you will consider a Workshare for next season. Like most kinds of farming, the work is rewarding both physically and mentally. Plus you’ll meet some great folks at the farm! Harvest Share people help out with harvest. In trade for a Couples Share ($700 value), we ask for 4 hours of work each week—usually on the morning or afternoon of your pick-up day. In trade for a Family Share ($900), we ask for 4 hours of work, plus an additional fee of $200. The work is neither difficult nor strenuous, but you do need to be in good shape (or willing to get back into good shape!) and be willing to work. You don’t have to know how to harvest – we’ll show you what to do. Harvesting begins promptly at 8 am. Being dependable and able to make a season-long commitment (June – October) is very important. Obviously, things will come up like vacations or illness. The “dependability” we’re looking for is for people who will be here each week or let us know ahead of time if know they will need to miss (we can work around that), or will call to let us know if they are sick or if they will be late. Market Share persons wash harvested vegetables and help stock them in the barn for pickup by our CSA members. Those who trade for a Couples Share will work 4 hours (10 am – 2 pm), and those who trade for a Family Share will also work 4 hours (10 am – 2 pm) and pay an additional fee of $200. You will work on your pick-up day. The work does require lifting. Please note that the market workshare also goes through the noon hour, so market workshare members will need to eat either an early lunch (before 10 am) or a late lunch (after 2 pm). It also requires getting wet; market workshare members need to bring waterproof boots and rain gear. Market Share people may be asked to do some harvesting at times. Here again, dependability is very important, as is making the commitment for the whole season. We are often asked if Workshare members can bring their children. We have tried this at various times through the years, but after each attempt have come to conclude that for reasons of safety, security, and liability, we need to limit this program to adults and in some cases to older children. We are willing to have children 11 years old or older accompany adults on a case-by-case basis. These older children need to be able to work with their parent for the full four-hour shift. Some eleven-year-old children can do this, some sixteen-year-old children can’t. If you have an older child you would like to work with you, please let us know in advance about your intention to do so.